Thank you for your interest in helping young people learn about Fraser River White Sturgeon and raising awareness of the importance of conserving this species. This program would not be possible without the financial support of HSBC Bank Canada. 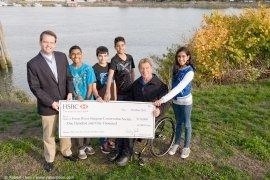 Their financial commitment to the conservation of the Fraser River Sturgeon has allowed this program to reach out to over 400 schools in British Columbia and now across Canada. Some pages will provide buttons to access content. Files included are in PDF format viewable with adobe reader. Click here to download adobe reader. You will also need to have flash installed which can be downloaded from www.macromedia.com. To view the video clips you will need windows media player on the PC side or quicktime for the Mac.